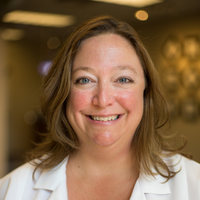 / Our Team / Tracie King, O.D. In 1998 Dr. King completed an internship at both the Lions Low Vision Clinic at the Wilmer Eye Institute at Johns Hopkins Hospital, and the VA Hospital in Battle Creek Michigan. Dr. King earned a BS in Physiology from Michigan State University, and earned her doctorate in Optometry from the Michigan College of Optometry in the spring of 1999. She has been practicing in Maryland since 1999. Dr. King has been in private practice in Elkridge since 2001. Her professional mission is to improve the quality of eye care and access to that care in Maryland through education and working with our legislators in Annapolis. She strives to provide the best care available to her patients, and to promote early detection for children's vision disorders. Dr. King was the President Elect for the Maryland Optometric Association for the years 2014 and 2015. She is also an active member of the American Optometric Association and Vision Source. In 2004, Dr. King was awarded the Maryland Optometric Association's Young Optometrist of the Year! Dr. King is currently serving on the Executive Board of the Maryland Optometric Association (MOA) as the Immediate Past President of the MOA.